A practice I’ve held, on and off, throughout the years, begins when I’m craving a particular restaurant meal. Instead of running for instant gratification, I put the ingredients of said craving on the grocery list and make it at home. I don’t do this every time (that would be crazy – I’m surrounded by fabulous restaurant food), but this general commitment, combined with some resourcefulness and willingness to substitute, has yielded delicious results. I highly recommend doing this at least some of the time; it will broaden your experience with cooking, and likely expand your spice cabinet and pantry items. In early days of my marriage, I made a real-food, totally nutritious version of Cheesecake Factory’s Louisiana chicken pasta (which always makes the list of America’s fattest fat dishes, or something) that, I’m pretty sure, solidified Joe’s inkling that I’m a keeper. Le Coq D’Or, a lovely little restaurant in Carmel, California, once served a meal I’ve since adapted for special occasions: chicken schnitzel, gruyere-gratined potatoes with fresh herbs, steamed broccoli, and mushroom-madeira sauce; it has won various hearts and minds. I”ve tried many Asian restaurant dishes, like Departure’s kimchi and pork belly fried rice, with less success in terms of authenticity, but oh, well. I don’t have a wok, and it still tasted good. Not blow-your-mind, chef Gregory Gourdet-style incredible, but home-kitchen fine. P.S. None of this is an Ode to My Cooking Skill. It’s stuff anyone with a modicum of adventure and flexibility can easily do at dinner time. One recent night, after one-plus martinis, I found myself really craving a giant pile of nachos al pastor. Unfortunately, at the time and place in which I happened to be situated, no nachos were available. Trust me, I wandered the streets ISO dive Mexican food; no dice. Though the gin eventually left my system, the craving persisted, and I decided to make nachos al pastor. My love for salad turned this idea into taco salad al pastor. The availability of red cabbage turned that idea into red cabbage slaw al pastor. Ethnic foodphiles everywhere may rage at this simplified definition, but: pastor is thinly sliced, marinated, grilled pork. It is traditionally cut from a pork shoulder roasted on a spit, gyro-meat-style, and served with pineapple. Possessing neither a spit nor a pineapple, I did things differently. I used apple cider vinegar for the marinade in place of white vinegar. I replaced the pineapple and the orange juice in the marinade with what I had on hand – kombucha, tangy and sweet. The results tasted nearly just like restaurant pastor. SO good! 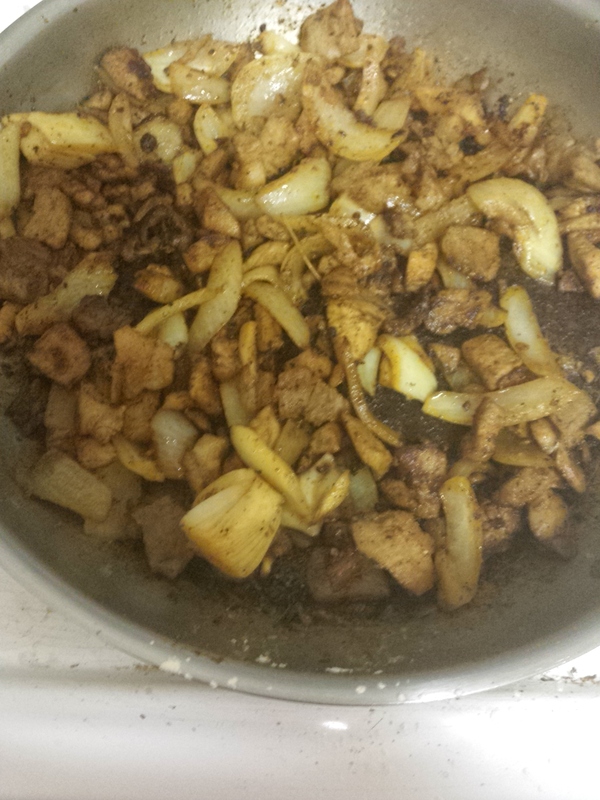 A day before or the morning of, combine the ingredients of the marinade and add in the pork. I used pork chops because that’s what I had that would partially defrost quickly. Cover and refrigerate until it’s time to cook. When that time arrives, drain off the liquid. 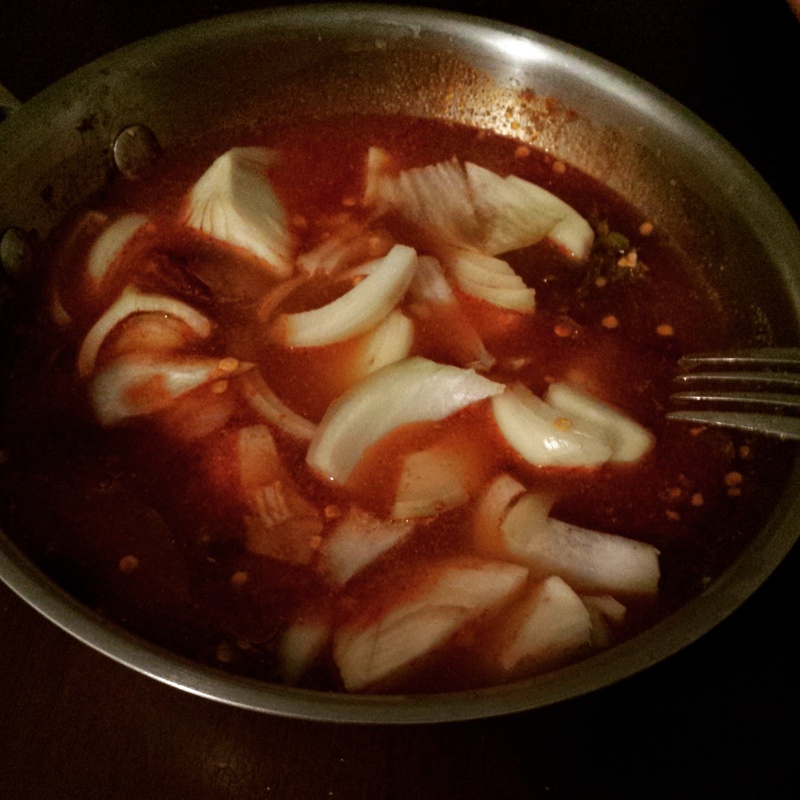 If you like spicy sauces, keep the liquid and simmer it until it reduces and thickens. You can top your slaw with it. If you don’t like things hot, discard the liquid and pick the chiles out of the meat. Cook the meat on medium high until all the liquid evaporates and the pork develops a lovely char. While the meat cooks, which it does quickly, prepare your toppings, i.e. chop vegetables, grate cheese, make the guacamole. For restaurant-style guac, use an immersion blender or whatever kitchen power tool you have to blend it really well. Layer or mix or slop your ingredients into bowls, and have some dinner! In your down-time, check out this article on why it’s beneficial to marinate pork. 31 Jan	This entry was published on January 31, 2015 at 3:55 pm. It’s filed under Collection and tagged DIY, eat at home, kombucha recipes, local grown, mexican food, organic, pork al pastor, real food, real food pastor, real mexican food. Bookmark the permalink. Follow any comments here with the RSS feed for this post. Kombucha in the marinade?? Yes please! Oh, do excuse my while i wipe the drool from my chin, I usually have better manners, but this looks SO GOOD. Thank you.